Portable heaters are the solution to a wide variety of heating and temperature issues. 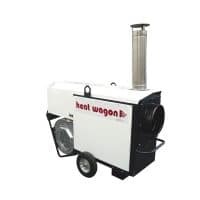 Our portable heaters are available for fast delivery and setup, so heating situations are resolved quickly. Emergency heating provided by portable heaters negate consequences of unexpected HVAC system failures. When cold teperatures threaten your construction project, portable heaters are available to keep your construction site appropriately heated.